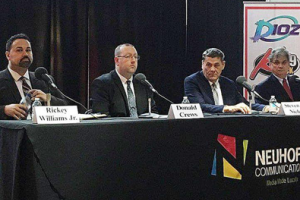 Neuhoff Media hosted a City of Danville Mayoral Candidate Forum on Thursday, March 28that the Village Mall. It featured mayoral candidates Rickey Williams Jr., Donald Crews, Steve Nichols and James McMahon. Residents will vote for Danville’s new mayor on Tuesday, April 2nd. Over 250 people attended the forum to hear the candidates discuss ways to fight crime, be more business friendly, revitalize neighborhoods and how the city addressed the interim public safety director position. In addition to attending the forum, local residents had a chance to listen to it live on WDAN and streamed on VermilionCountyFirst.com.